Eric Herman, the YouTube star (50 million views), dad and nationally touring artist, is back with a new album of original songs. Eric's music crosses genres and age levels. "Eric Herman, a nationally touring, award-winning family music artist and YouTube music video star, has created a new album of songs ranging from funky dance tunes to soft and sweet celebrations of life. Five years in the making, Party Animal features guest artists DidiPop, members of Recess Monkey and Chris Ballew (The Presidents of the USA/Caspar Babypants). The energetic “jump, jump, jump and jump and jump” song “November First,” was co-written with Children’s Poet Laureate Kenn Nesbitt, a frequent creative collaborator. Although this one-man band often performs solo with his "Invisible Band," he now also leads a fully visible live band called Eric Herman and the Thunder Puppies." "I'm shakin' like the bacon daddy's makin' with his eggs." It has been five years since Eric Herman released his last CD. But, the wait is finally over, and I have to say that Eric has a winner with his 6th CD. Filled with funny songs both kids and adults will enjoy listening and singing along to, Eric's new CD will definitely become a staple during summer road trips this year. Even though we have only had Eric's new CD, Party Animal, for about a week now, the girls already have a handful of his songs memorized, thanks to a recent car ride during this past Memorial Day weekend to visit family, as well as listening to the CD at home, while dancing around to the funky beats. The CD has 10 tracks in total, and each will entertain and put a smile on your face as you listen to it. Our personal favorites include "Can We Buy a New Car (So I Can Have a Balloon)? ", which has a fun county feel to it, as well as the Beatle-esque "The Best Parts," and the powerful rock anthem, "Alive." Eric, a father himself, knows how to entertain children of all ages, and this can be seen with his hit albums that he has released over the years. I personally love how he uses different musical styles with his songs, letting children experience different beats and sounds. And, with silly lyrics and catchy chorus lines, kids and adults can't help but want to get up and move around while listening to Eric's music. 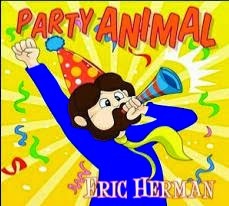 If you are looking for some great kid-friendly music to pick up for upcoming road trips, or just to get kids active and off the couch this summer, you will definitely want to check out Eric Herman's new CD release, hitting store shelves on June 4th, "Party Animal." And, get ready to move and groove and laugh out loud, as you fall in love with the 10 new songs from Eric. We can't get enough of this new CD, and am happy that we have another CD to add to our growing Eric Herman collection. Eric's traveling to many cities this summer, bringing his new tunes to you. He's in Texas, Louisiana, Oregon and Washington in June, and California, Utah and Washington in July. Details about Eric's extremely packed summer concert tour are available on Eric's schedule page.